John, breaking news. We’ve just received a bulletin and we are going live to Bulls practice. Take it away on the scene. Derrick Rose is not playing Saturday in Game 7 against the Brooklyn Nets. “I’m feeling about the same, still being patient, still trying to take care of my body and trying to enjoy this time and cheer on my teammates,” Rose told reporters Saturday morning. “It’s been hard. But I’m able to get past it knowing my teammates are out there playing hard, giving the game everything they got. That’s all I can ask for. Still trying to take my time. Still the same old thing. If anything, trust me, I’ll let you all (media) know. I swear; if anything changes, trust me, I’ll let you know. Every time Rose does one of these media update sessions, like he did Saturday morning after Bulls practice, it reminds me of the old Saturday Night Live Weekend Update segments when they breathlessly reported each week “Generalissimo Francisco Franco is still dead!” It was a wry takeoff of the serious then TV nightly network news coverage from most of those weighty newscasts reporting of the Spanish dictator in poor health. 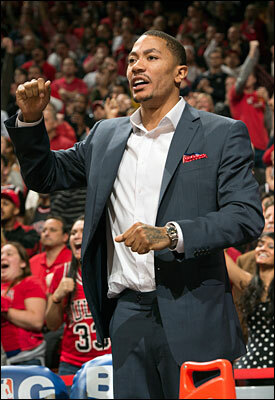 A few months back, Rose had not spoken with media since the opening of Bulls training camp in October. Then he did an interview with USA Today before the All-Star weekend and followed that up with periodic informal conversations with local reporters and with national TV reporters when the Bulls were in the national game. Some would lead to breathless reports like that of his hamstrings on fire, which was said to have put on notice several Chicago fire companies and a Boys’ and Girls’ club bucket brigade. So Saturday after the Bulls morning shootaround before what could be the Bulls’ last game of the 2012-13 season, Rose met with reporters who had been getting their twice daily vague team health updates from coach Tom Thibodeau. In response to questions, Rose said he really hasn’t been aware of much criticism directed toward him about playing, seemed genuinely surprised some have suggested he is being manipulated not to play, is feeling no pressure from the team or teammates to play before he is ready, holds out hope he still could return if the team wins Saturday and his health improves, and if he does sit out the season he believes he will return better than ever. Rose responded, “No,” when asked if he should announce he’s definitely out for the season. He supposedly has told the Bulls he doesn’t want the option removed. One of the active conspiracies regarding Rose as well as Amelia Earhart’s disappearance and the Kennedy assassination has been that shadowy figures like Rose’s brother Reggie and agent B.J. Armstrong have been Wizard of Oz-like figures behind the curtain manipulating a great hoax and preventing Rose from playing. Rose seemed genuinely surprised when asked about that, at least proving he doesn’t listen to talk radio or spend time in internet chat rooms. Also demonstrating he probably makes better use of his time than most Americans. “Who said that!” Rose asked somewhat sharply and curiously. Several times with a laugh Rose repeated he is continuing to rehabilitate and what you see is what it is, and he’s not physically and mentally ready to play. “I haven’t had any pressure anywhere,” Rose said. “You hear stuff. People say stuff. A lot of people text me, asking if I’m doing all right because I guess they’re paying attention to what’s going on in social media. I’m far from it. I rarely watch games if it’s not our game. I’ve been watching teams the whole year. There are good teams out there. I’ve just got to get out on the court and play. The Saturday Night Live segment actually stems from the saturation news coverage, at least for that era, of the 1952 premature death of famed actor John Garfield. The Academy Award winning actor was a critic of the crazed House Unamerican Affairs which hunt committee and a blacklist victim whom many believe was hounded to death by incessantly false and scurrilous media coverage questioning his loyalty. More than 10,000 New Yorkers crowded his funeral, one of the largest in city history. Though given Rose apparently doesn’t follow the internet too closely he’s probably unaware of that as well. Good thing.